Rebecca Davis with her children Oliver Haluszkiewicz (11) and Saskia Haluszkiewicz (6). Picture: Andrew Ritchie. DECEMBER is a hectic time of year but the Davis family have found a way to spend time together by all performing in A Dickens of a Christmas. 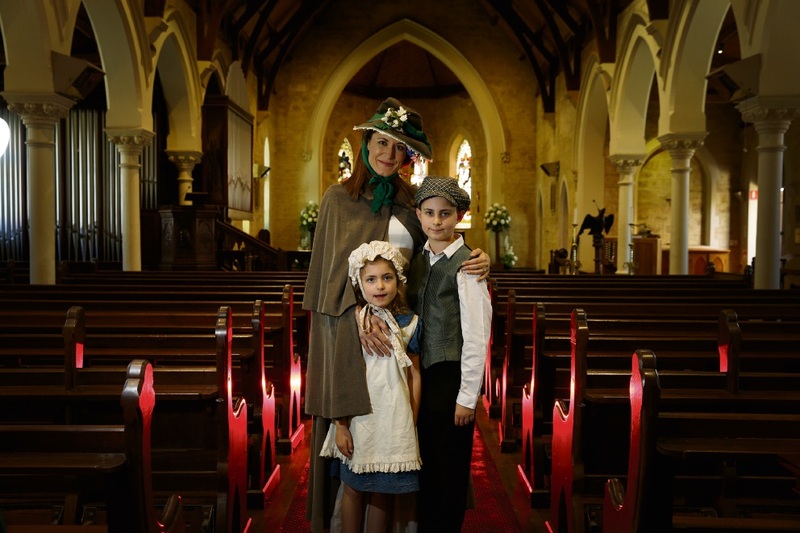 The production, based on Charles Dickens’ classic A Christmas Carol, will be presented for the fifth year by director Anthony Howes and WA Senior of the Year actor Jenny Davis, of Mt Hawthorn, at new venue Christ Church in Claremont. Joining narrator Jenny Davis on stage this year will be her husband Bernie as Old Marley, their daughter Rebecca (Black Swan State Theatre Company) as Mrs Cratchit, Rebecca’s husband Stuart Halusz (Black Swan State Theatre Company associate director) as Bob Cratchit and their children Oliver (11) as Tiny Tim/young Scrooge and Saskia (6) as young Fan. “I have been wanting to do something with the whole family because it’s rare for my dad to perform these days,” Rebecca said. Rebecca said her children, who attend Kyilla Primary School in North Perth, had stage experience from acting in their grandmother’s Agelink Theatre company and could possibly follow in the family acting footsteps. “I keep telling them there are lots of other vocations they can do and lots of different courses they can study at university,” she said. A Dickens of a Christmas is a shortened version of the novel and tells the story with live music by The Giovanni Consort, the Royal Agricultural Society’s Perth Brass Ensemble and organist Stewart Smith. Rebecca said it was accessible to all ages and very much a family show. “It’s a great story around Christmas time with all the values of what Christmas is about,” she said. “For me it’s the first big event rolling into the Christmas period and I think that’s lovely. All proceeds from the production will go to the homeless, through Volunteering WA and the Order of St John of Jerusalem Knights Hospitaller. Rebecca said her parents would host family Christmas this year with her brother, sister-in-law and two nieces visiting from Canberra. “We’ve lived here for 40 years now; my parents came out from England for two years and stayed, like many do,” she said. “Mum still finds it hard that Christmas is in summer and not winter so we still do the full turkey, Christmas pudding, mince pies, stuffing, the whole kit and caboodle with the aircon on; I love that tradition.